BEAUTY SPOT: Wilpena Pound, a natural amptheatre of mountains, is located in Southern Australia. 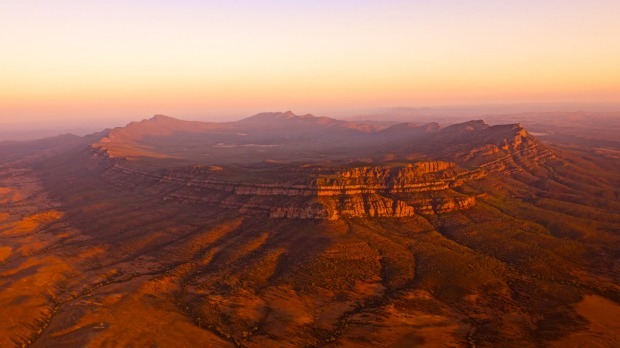 Located 429 km north of Adelaide, Wilpena Pound lies in the heart of the north Flinders Ranges and is a remarkable natural amphitheatre covering nearly 8000 hectares. It is a huge flat plain covered in scrub and trees and totally surrounded by jagged hills which form a rim. From the ground it looks like a rugged low mountain range which can easily be traversed. When you reach the top you look across the plain and can clearly see the hills around the edges. From the air it is a remarkable sight. It is claimed that the word 'wilpena' means 'place of bent fingers'. Wilpena Pound is basically for bushwalkers. Certainly it is true that the road to the 'pound' traverses some of the most beautiful country in the whole of the Flinders Ranges (this was where Hans Heysen found the inspiration for some of his most famous gum tree paintings) but when the traveller arrives at Wilpena Pound there is nothing to do but walk. That is not a bad thing. But it is the reality of the experience. The Flinders Ranges, of which Wilpena Pound is the emotional centre, were first sighted by Matthew Flinders in 1802. He lent his name to the low lying range of hills which starts south of Port Augusta and stretches northward for some 500 kilometres. In 1839 Edward John Eyre traversed the ranges as he travelled north discovering the vast Lake Eyre which lies to the north of the range. By the 1850s, although the land was deemed to be beyond the limits of cultivation, large tracts of the land were being leased. Wilpena Pound was leased in 1851 and, given its natural protection, was first used as a large horse breeding area. The horses were simply led into the 'pound' and left to their own devices. In 1899 the Hill family who lived at Hawker took out a lease over the whole of the pound. They cleared the land and started wheat farming. If you come across old pieces of farm equipment while walking in the pound it probably is left from these days. By 1904 the Hills were doing sufficiently well from their wheat that they built a small stone house near the entrance to the pound. They lived there until 1914. A resort was established near the only entrance to Wilpena Pound in 1945. It was administered by the South Australian Tourist Bureau. By 1972 the pound was under the control of the National Parks Commission and it has remained under government control ever since. In recent times Rawnsley Park Station, which is located to the south of the pound, has established itself as a modestly priced caravan park with good quality apartments (taken from a nearby mining site). It offers a range of activities including scenic flights over the Pound, horse riding and bicycling, as well as interesting and unusual walks to the Pound. See below for more details. This takes between 1-2 hours and is a relatively easy walk which goes through the Pound Gap, past the old Hill homestead and up the easy edge of the Pound so that, by the time the walker reaches Wangara Lookout, they have good panoramic views across the Pound. This 1.5 kilometre walk takes about one hour and is an introduction to the flora which survives in this land where the rain and water supply is both low and unreliable. This is a 2-3 hour walk which is strenuous but offers the walker a good view of the Pound floor and the country which lies to the east of the Pound. 15 km from Wilpena there is a car park at the foot of Arkaroo Rock. The walking trail from the car park takes about 1-2 hours but the rock walls have some very fine Aboriginal art including red ochre images of emu and bird tracks, snake lines, circles and leaves. This is an 8-9 hour walk to the north west of the Pound. It goes to Edeowie Creek and Malloga Falls and enters and crosses a section of the Pound. The highest peak (nearly 1200 metres) in the Wilpena Pound area this is a challenge for bushwalkers. The walk takes about 6-7 hours. It is a difficult walk but the walker is rewarded with an outstanding view of the whole of the pound. This is part of the Heysen Trail which runs from Cape Jervis in the south to the northern end of the Flinders Ranges. It takes about 6-7 hours, crosses the Pound floor and passes over the Pound's western flank at Bridal Gap. Rawnsley Park Station, which is located on the road south of Wilpena Pound and clearly signposted, was first settled by Europeans as part of Arkaba Station in 1851. Arkaba, Wilpena and Aroona were the first pastoral leases in the Central Flinders Ranges. The leases were granted for 14 years on what was described as 'unoccupied waste land'. It is a comment to the tenacity of the farmers who settled Rawnsley Park that they persisted where many of the others in the area were defeated by droughts and government subdivisions. In 1895 the section of Arkaba Station now known as Rawnsley Park Station, a portion of 6253 acres, was separated off and leased to a Mrs Fahey of Carrieton. The lease passed to a Mr Nugent in 1905.He built the simple stone house which still stands on the property near the old wagon. The Nugents started the present homestead in 1915 and it was completed by the next owner, Mon tgomery Haeusler, in the 1920s. The lease passed to a Neil Cutten in 1937 and in 1953 Clem Smith, father of the present owner, acquired the property. He added 1200 acres so the property is now 7453 acres. In 1968 Clem Smith started the Rawnsley Park Station accommodation with a single self-contained cabin. Since then the destination has grown so that it now includes conducted horse riding treks, hired mountain bikes, a range of 4WD tours, sheep shearing demonstrations and flights over Wilpena Pound. It also offers a variety of accommodation with a strong camping, caravan, family and group orientation. An impressive gorge which meanders between sharp ridges. It is located north of Wilpena Pound off the main road to Blinman and is characterised by precambrian and cambrian rocks with extensive fossils. It was once used as a pass by bullock teams. An excellent place to view fossils and to explore the Mt Billy Creek. The walk takes about 4 hours. Look out for the small cone-shaped fossils embedded in the walls of the gorge. Located off the Blinman Road this is one of the most famous trees in Australia. Photographed by Harold Cazneaux in 1937 and called 'The Spirit of Endurance' it was reproduced on calenders and posters all over the world. This is an area where it is possible to see a wide variety of flora and fauna in their natural habitat. The pound is home to Sturt's desert pea, river gums, mallee, acacia and casuarinas. The wildlife includes the red kangaroo, the euro, the yellow-footed rock wallaby, 18 species of snakes, 60 species of lizard, dingos, emus, galahs and wedge-tailed eagles.